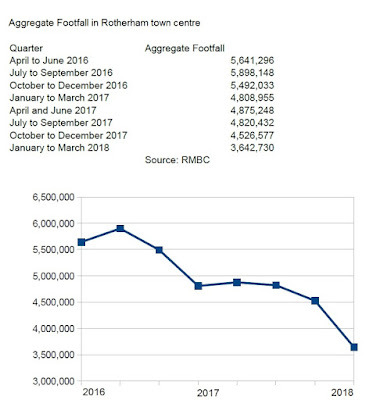 In less than two years, the aggregate quarterly footfall figures for Rotherham town centre have dropped by two million. Rotherham Council publishes the figures as part of monitoring the progress of its Council Plan but the authority's cabinet recently approved an updated set of indicators, removing aggregate footfall from the plan. The quarter including July to September 2016 was the quarter with the highest aggregate footfall recorded, at 5,898,148. For the latest quarter available, January to March 2018, this has dropped to 3,642,730. In the same quarter in 2017, the figure was 4,808,955. A report to the Council's cabinet states: "The closure of Primark in November 2017 has had an evident negative impact on footfall, resulting in an average monthly decline of 40% alone on High Street (and 19% overall from 2016-17 to 2017-18), highlighting the significance of this key anchor retail store. The rest of the town centre saw a decrease of 12.56% compared to 2016-17. "It is worth noting the decline is reflected at a national level as shopping habits continue to change, with all regions across the UK witnessing a notable slump in footfall in December (Source: Springboard). "As the Town Centre Masterplan comes to fruition, it is anticipated that the developments may help to reverse the decline in footfall." The report also shows that vacant floorspace in the town centre is at 23.1% and that "this decline is seen at a national level due to changes in shopping habits." At under 20% in previous years, the target for 2018/19 is to keep the vacant floorspace under 25%. 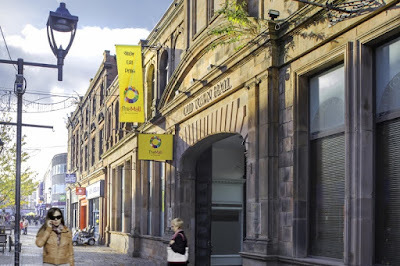 The Council has been assessing a range of measures to try and stimulate footfall and support existing businesses as they wait for the catalyst projects in the new masterplan to revive the town centre. These include parking incentives, free Wi-Fi, proposals to incentivise new shop traders to move into the town, the introduction of a Public Space Protection Order (PSPO), marketing and promotion and opportunities for "meanwhile uses" and window/frontage treatments. In April 2017, Rothbiz reported on how analysts set out that retail is not the answer for regenerating Rotherham town centre. The masterplan aims to consolidate retail and instead focus on new housing and boosting the leisure offer to breathe new life into the town centre. Future reporting on the town centre will include the vacant floor space indicator but the footfall figures are to be replaced by an indicator recording the net number of new business in the town centre. Earlier this year, Damien Wilson, Strategic Director for Regeneration and Environment at Rotherham Council, said: "There is too much floorspace in the town centre, we have to be open and honest about that. The town centre has changed dramatically in the last 20 years and the needs and demands for retail units now are different to they were then. If you look at some of the bigger floorspaces around town, they'll probably be empty for quite a long time. It's going to be difficult to attract the big retailers in. "What we need to try and do is focus on bringing new businesses in, like we have done on the High Street successfully, maintain that and reduce the number of businesses that are struggling that actually end up closing." Er, isn't it the job of our AWARD WINNING PLANNERS to sort this one out? After all, they are the ones that imposed street after street of pedestrianisation, limited parking spaces for shoppers, increased parking fares for shoppers, not to mention the very expensive big telly on a stick catastrophe and any number of other bonkers bright ideas. it has been evident for years in this area, due to Meadowhall and Parkgate that free parking is a necessity not a nice to have. Yet labour politicians constantly tell us they learn from past mistakes! Well not so far as I can see but people continue to vote for mediocrity? Can't explain that either.